All you want to know about what is going on with this year’s peach festival- including registration forms and online payment. 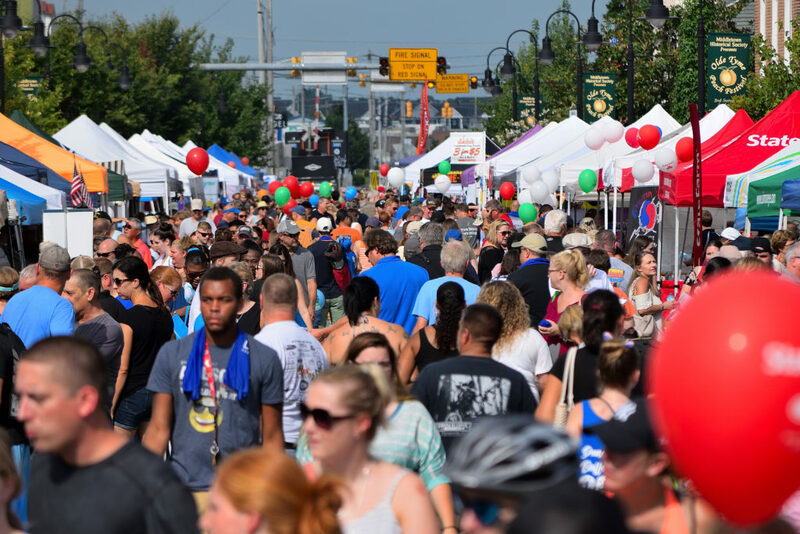 The 2019 Middletown Peach Festival will be held Saturday, August 17, 2019, beginning at 8:45 am with the annual Peach parade on Broad Street and will conclude at 4 pm. Many activities are centered around Main Street. Main Street and a portion of adjoining N Cass Street will be closed to traffic for the event. Entertainment is scheduled throughout the day around town. There are activities for children, a local artist exhibit, historical exhibits, a peach pie contest, crafts, music, food, games, and of course – Peaches! The Peach Festival is a rain-or-shine event! Last year’s attendance was about 27,000 people. NEW: SPONSORSHIP BOOTHS- All sponsorship booths include a 10 x 10 booth space, and your name placed on the Peach Festival peach bags, and advertising. We have a limited number of sponsorship booths and may not be able to accept everyone who applies. Registrations must be paid in full and accepted. Please contact Brian Rickards at MiddletownPeachFestival@Gmail.com for more info on advertising in our Peach Map Flyer or other Sponsorships opportunity like Title Sponsor, Main Stage, Parade, Music & Food Tent Sponsorships. Peach Deluxe Premium sponsorship booths are located on the north & south side of Main Street, closest to Cochran Square. They include the space, your corporate name on the bags, and a spot at the head of the parade, immediately following the honor guards and official units, your parade entry form is needed. Cost, $3000. Peach Premium sponsorship booths are located on the north & south side of Main Street, following the Deluxe Premium Sponsorship booths. They include the space, your corporate name on the bags. Cost, $1000. Peach Deluxe Standard Sponsorship booths are located on the north & south sides of Main Street, following the Premium Sponsorship booths. They include the space, your corporate name on the bags. Cost, $500. Peach Standard Sponsorship booths are located on the north & south sides of Main Street, following the Deluxe Standard Sponsorship booths. They include the space, your corporate name on the bags. Cost, $300. Non-Crafter Cost: 10′ x 10′ space (Informational/Advertising, Political or Other) are charged $175.00 for each space on Main Street; all other areas are $150.00. Space will not be reserved until application & payment are received. Crafters Cost: 10′ x 10′ space (100% handcrafted) are charged $150.00 for each space on Main Street; all other areas are $125.00. Spaces: You are welcome to use as much space as necessary to adequately demonstrate your craft with a maximum limit of 3 spaces, 10’x10′ each. Unless you indicate otherwise, we will assume a 10′ x 10′ space. Expectations: By participating in the Peach Festival we asked not to sell peaches but you can sell peach products and related items. All food & or drinks requires a special Health permit, Please call Brian Rickards at MiddletownPeachFestival@Gmail.com for more information. Application Requirements: Please include a description of your product, craft or pitch on your application. All booth operators must provide their own tables, tents, chairs, and displays. Unfortunately, no electricity hook-ups are available. No generators are allowed. No vehicles and or trailers will be allowed in any of the rented spaces. Setup-Cleanup-Etc. : Set-up will only be on Saturday morning from 6:00 a.m. to 8:00 a.m. You are responsible for cleaning up your area and removing your trash at the end of the festival. Time slots, booth numbers, approximate location, entry point, and parking information will be sent via e-mail one week before the event in August. Festival Questions and Request Forms: Preferably, send an e-mail to middletownpeachfestival@gmail.com; we will be checking e-mail regularly and will respond to you as soon as possible.